When dhol did rhythmic dance with drums, the atmosphere was very musical and enthralling. “Angels of Rock” is a new TV show running on musical channel MTV. 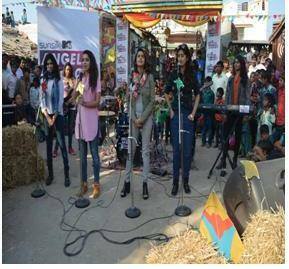 This show features women empowerment and adventure of four rising singers Shalmali Kholgade, Anusha Mani, Jasmine Sandlas and Akasa Singh riding across the nation to gets inspiration from women strength and actions. In their road journey, they are meeting women with exclusive power and achievement. So they discovered Rudi No Radio, an Ahmedabad based radio station that is completely managed by women. These Angels spend their two days entirely with Radio team to understand their work. They were inspired to see how these women are handling tough job of radio production very actively. Radio team is not professional by their degree but they are smart enough to give competition to main stream channels. Angels also visited villages in the vicinity of radio station and met radio listeners. They were surprised to see the fan following of radio team. Rudi No Radio is very elegantly catering information along with entertainment to its listeners. The main objective is to empower women through educating them using communication tool. 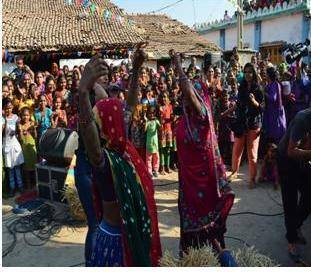 When Angels saw this concoction of information and entertainment they presented a song dedicating to women of radio team and their hard work. The show depicted the real folk and power of women through featuring Rudi no Radio story.